making architecture disappear: i was quite saddened when only the other day i discovered that they are remodeling the ticket hall /underground peristyle/ of subway stop “östermalmstorg” in my native stockholm. i immediately regretted not having photographed this extraordinary and monumental underground hall before they started messing with it. the rather vast hall will, from what i understand, pretty much disappear as the spacious colonnade - with its sophisticatedly designed concrete columns (cross shaped base and shaft/square capital) - is being filled with shops à la shopping mall. this i found very sad on a personal level, because this is perhaps the one space in my native city where i “discovered” architecture: how it is made, how it works, how it affects one’s mind. i had for years been passing through this space, not really paying attention to it, other than sensing this space to be “different” from other spaces of the stockholm public transport subway system (the “tunnelbana”). but for some reason, one day i came to reflect on why i thought of it as “different.” and, presto, i had discovered architecture: hey, wait a minute, i thought to myself, when you walk down the stairs from the street to the underpass level, you only walk one short flight of stairs. the ceiling of the underpass is really low, because the street is just above it. but once you arrive in the ticket hall, it’s really spacious all of a sudden. yet i am still as close to the street level as before. there should be no room for such a high ceiling, and such tall columns, when the underpass was dug so shallowly; dug to just below street level. the rather large volume and columns of the ticket hall must therefore be sticking up somewhere in the city, high over the street level. it should be visible from all around as a blank concrete box sticking up out of the ground. but i had never seen such a thing in the street. where was it hidden? i was just a kid in middle school, and needed a method to solve this conundrum - but had had no introduction to any such method at my young years. i had to invent my method: i started to in my mind build 3d models, i suppose, combining plan and section/elevation, trying to solve this intricate 3d puzzle. the solution to the puzzle was simple, of course, once i had figured it out: the underpass was long enough to lead well away from the public street, in under a nearby building. this building which i figured had to be hiding the ticket hall top section from sight, looked normal enough from the street: store fronts, shop windows. but if i should decide to drive a bulldozer right through one of the shops, breaking through the back wall, i would not arrive in a courtyard or parking lot, as expected. i would come crashing through the upper part of the wall of the ticket hall colonnade, i would fall merciless several meters/feet, crashing into the ticket hall floor below, below street/shop level. but how would the public transport authority get to create such an extraordinary thing? 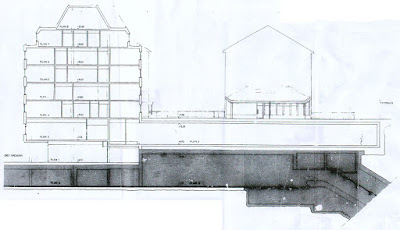 how would they get to use up so much land and space for a vast hall; land and space which the land owner would rather use for something more beneficial to him- or herself personally (a pleasant courtyard garden? a car park? more floor surface for shops to let?). i realized there must have been some sort of deal-making between the public transport authority (i.e. the tax payers) and land owner in question to solve the conflict between public and private interest. or the public sector/government would have had to purchase the entire plot of land. so which was it? i took notice of what kind of offices/activities filled the building on the floors above the normal looking store fronts, and the building seemed to be used exclusively by tax funded things (public health care etc.). i assumed that this particular building - which looked pretty much like all other buildings around it - probably was not privately owned like most of its neighbors. it was probably owned by the stockholm county (“stockholms läns landsting” - which is responsible both for stockholm public transport and public health). ownership certainly made a difference here. i had thus discovered that architecture works on all possible levels. architecture is not just a visual and spatial experience. architecture - and the visual and spatial experience of it - depends entirely on financial, political, and social factors; depends entirely on ownership, etc. 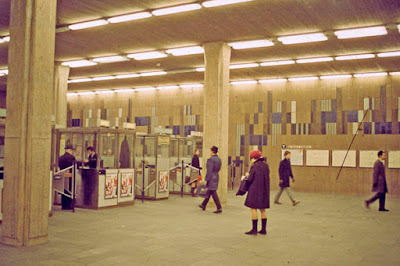 i had learned that a price had had to be payed to make the östermalmstorg station peristyle possible: to raise the ceiling of the ticket hall, floor surface was lost for letting to shops in one of stockholm’s busiest shopping districts. and i had also learned that architecture indeed “works” even when people don’t pay attention to it: i had after all, on some inarticulate level in my mind, already noticed that this particular ticket hall was “different” from (was “better” than) all other comparable spaces in the city’s entire subway system long before consciously reflecting over how such an effect could be achieved by architectural means. it took some figuring out for a middle school kid, without ready tools, just how and why this space was different/better. but the architecture was “working on me” long before i stopped to think about such matters. i had learned that architecture changes things, and affects the lives of people - also when not reflected upon actively by the people experiencing it. my beloved underground peristyle is going to the dogs: goodbye dear old friend. but, hey, perhaps one day everyone will realize what was lost in the process. and someone will restore the peristyle to its original splendor. goodbye - and see you again sometime? p.s. does anyone who reads this have more pictures of the östermalmstorg ticket hall colonnade as it was before, in its original splendor? would you consider sending them to me and let me post them on this blog? d.s.